For the most part, I write about things as I remember them, which, on occasion, means I’m either way off or totally wrong. Today’s blog could very well be one of those times, so in advance, keep that in mind. I grew up in Valley Stream, NY, which borders the town of Elmont, home of Elmont Memorial High School and the world-famous Belmont Race Track, where the Belmont Stakes takes place, the third jewel of horse racing’s triple crown. In 1980, when I started going to Elmont for 7th grade, one of the hangouts nearest the school was Friendly’s, an ice cream parlor/restaurant which most kids drooled over. On nights school functions (concerts, pep rallies, the Fall dance, etc.) took place, my parents often took me and my younger sister over to Friendly’s as a treat. I can’t say for sure that Friendly’s was the first parlor where I ever got an ice cream float, but I can say this: it was the only place where I got one in the iconic Coca-Cola float glass. So, while my memory may not be 100% accurate about a lot of things, I can remember that. And, probably somewhere around Fall of 1980 or Spring of 1981, I was taken by the cool design of that glass. Time passes. I get older. Going to Friendly’s is still cool, even though I’m usually there with friends as opposed to squeezing into the tight booths with sis and my parents, while tables full of teenagers around us were shooting straw wrappers at one another. I’m guessing I was about 16. Could have been younger, because I remember having money in my pocket, but I got a paper route the day I turned 14 and got my working papers (remember those? ), so I always had some coin on me. Anyway, the important thing is, I sit down at a booth with my friends, and what do I see on the menu cover? 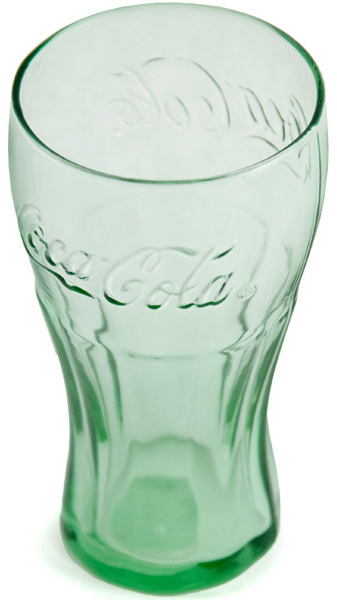 Yep, the Coke float glass. Only, it wasn’t just the float that you could buy. The glass was for sale. Now, true. In retrospect, a 16-year-old kid hanging out with his friends probably shouldn’t have caught the waitresses’ attention and told her to pack up four glasses—sans float. Heck, I might’ve been thirsty, but I sure wasn’t that thirsty. Still, I knew one thing—I wanted those glasses. And I knew how we’d all ordered floats at one time or another, and the appeal the things had for my whole family. So, to heck with the possibility of dropping the bag and all four turning into splintered shards. I was taking these straight home and nothing was going to stop me. I think at the height of the collection, there were about ten in the kitchen cupboards. And, sometime before I moved out and got my own place, we were down to two. I’m not sure what happened to those. I do know that some were replaced, because years later, plastic versions were made available, and I stocked up on those, too, when I came across ’em. ’83? ’84? I don’t know. Maybe. As mentioned, this one’s not about pinning down the year a certain collectible or iconic piece was released. This is about how cool it was getting the chance to take something home that I’d enjoyed so many times on those special nights with my family. And, you know what? I’d have spent every dime in my pocket to bring those glasses home. Who knows? Maybe I did. And here’s how it ends. That was a Friday night—that much I do remember. Saturday night, I busted those bad boys out right before dinner. For dessert? I’m sure you can guess. How about you? Were you floored the first time you got to buy something merchandised from one of your favorite haunts? A green & yellow John Deere hat, maybe? McDonald’s character glasses featuring the Grimace and Hamburglar? What treat couldn’t you leave without purchasing to make it a part of your home?